McMillan & Wife (known simply as McMillan from 1976–77) is an American police procedural that aired on NBC from 1971 to 1977. Starring Rock Hudson and Susan Saint James in the title roles, the series premiered in episodes as part of Universal Television's wheel series NBC Mystery Movie, in rotation with Columbo and McCloud. Initially airing on Wednesday night, the original lineup was shifted to Sundays in the second season, where it aired for the rest of its run. For the final season, known as McMillan, numerous changes were made, including the killing off of St. James' character of Sally McMillan. McMillan & Wife was the first element to be created for the Mystery Movie strand. McMillan & Wife revolved around a 40-ish San Francisco police commissioner, Stuart McMillan (Rock Hudson) and his attractive, bright and affable 20-something wife Sally (Susan Saint James). Often, the storylines featured Mac and Sally attending fashionable parties and charity benefits before solving robberies and murders. John Schuck appeared as McMillan's likeable, if somewhat bumbling aide Sgt. Charles Enright and Nancy Walker was Mildred, the couple's sarcastic, hard-drinking maid, both characters serving as comic relief. Sally is pregnant at the end of season 1, but this is apparently retconned away and is never mentioned in later seasons. She is pregnant again in season 4, and has the baby (a boy) in the final episode of season 4. The baby is not seen or mentioned in season 5. Mac and Sally with Dr. Marion Voight (played by Sheree North), 1972. The show ran for five seasons as McMillan & Wife and a sixth season as McMillan on the NBC television network, from September 17, 1971, to April 24, 1977, for a total of 40 episodes. The NBC Sunday Mystery Movie program worked on a rotating basis - one per month from each of its shows. 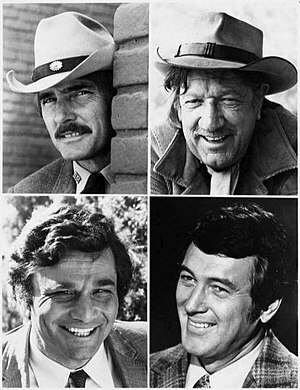 Top left: Dennis Weaver in McCloud. Top right: Richard Boone in Hec Ramsey. Bottom left: Peter Falk in Columbo. Bottom right: Rock Hudson in McMillan & Wife. Like the other two original shows in the NBC Mystery Movie, McMillan & Wife was an immediate hit. After its network run on NBC, it appeared regularly as part of The CBS Late Movie and later, in the form of syndicated reruns on local and cable television in the United States. On January 1, 2015, McMillan & Wife began airing on Me-TV as part of the "MeTV Mystery Movie" late night block. That block included the other two long running Sunday Mystery Movie series, McCloud and Columbo, the Wednesday Mystery Movie series Banacek, and the Perry Mason television movies. Each week featured a different series, with the series airing every night during its feature week. These airings have since ceased. For its sixth and final season, the series underwent a major retooling. Susan Saint James left after being unable to come to terms on a new contract. Nancy Walker also left the series before the sixth season premiered in 1976 to star in an eponymous sitcom. With these developments, the show became known as McMillan and Sally was killed off in a plane crash along with the couple's never-seen son. Mac, now a widower, moved out of the family home and into a luxury apartment. Mildred, meanwhile, was written out as having left the McMillans to open her own diner on the East Coast, which was an inside joke playing up her role as Rosie the waitress in a then-ongoing series of commercials for Bounty Paper Towels. John Schuck had his role reduced as he joined the sitcom Holmes and Yo-Yo, which show director Leonard B. Stern was working on. Martha Raye, who had played Mildred's sister Agatha in an earlier episode, joined the series full-time with Agatha taking over Mildred's role as Mac's housekeeper in his new apartment. Meanwhile, Sergeant Enright was promoted to Lieutenant and became Deputy Chief of the San Francisco Police, which took him away from his position as Mac's liaison. Richard Gilliland joined the cast as Enright's replacement, Sergeant DiMaggio, who always introduced himself by saying "no relation" (in reference to Joe DiMaggio). Universal Studios Home Entertainment released the first season of McMillan & Wife on DVD in Region 1 & Region 2 in 2005/2006. On May 21, 2010, Visual Entertainment announced it had acquired the rights to distribute McMillan & Wife on DVD in Region 1. They subsequently released seasons 2-6 on DVD in Canada and the USA. All US releases are distributed by Millennium Entertainment. On November 30, 2012, VEI released McMillan & Wife - The Complete Series on DVD in both the US and Canada. This 24-disc set features all 40 episodes of the series as well as bonus copy of The Snoop Sisters Complete Collection. In Region 4, Madman Entertainment has released all six seasons on DVD in Australia. On November 20, 2013, it released McMillan and Wife: The Complete Collection, a 19-disc set featuring all 40 episodes of the series. The interior set of the McMillans' home in the pilot episode was actually Rock Hudson's house. In the second episode they moved to a new home, exterior shots were done on Greenwich Street in San Francisco. The address for the couple was once given in the show as 250 Carson Street. In later episodes a different house was used as the exterior shot of the house. In the final season McMillan, newly widowed, moved into an apartment and the house was never seen or mentioned again. ^ "McMillan and Wife DVD news: DVD Plans for McMillan and Wife's remaining seasons". TVShowsOnDVD.com. Archived from the original on 2013-11-09. Retrieved 2013-08-01. ^ "McMillan & Wife: Season 6: Rock Hudson, Susan Saint James, John Schuck, Nancy Walker, Martha Raye, Leonard B Stern: Movies & TV". Amazon.com. Retrieved 2013-08-01. ^ "Mcmillan and wife dvd collection, Rock Hudson, Susant saint james, Columbo, Mcloud, NBC Mystery Movie line-up | Visual Entertainment Inc". Visual-entertainment-inc.myshopify.com. 2012-11-30. Archived from the original on 2013-01-25. Retrieved 2013-08-01. ^ "McMillan and Wife DVD news: Hudson and Saint James grace the cover". TVShowsOnDVD.com. Archived from the original on 2012-10-19. Retrieved 2013-08-01. ^ "McMillan and Wife DVD news: Release Date for McMillan and Wife - Season 2 in the USA". TVShowsOnDVD.com. Archived from the original on 2013-11-09. Retrieved 2013-08-01. ^ "McMillan and Wife DVD news: Box Art for McMillan and Wife - Season 2". TVShowsOnDVD.com. Archived from the original on 2012-10-14. Retrieved 2013-08-01. ^ "McMillan and Wife DVD news: Release Date for McMillan and Wife - Season 3 in the USA". TVShowsOnDVD.com. Archived from the original on 2012-10-19. Retrieved 2013-08-01. ^ "McMillan and Wife DVD news: Announcement for McMillan and Wife - Season 3". TVShowsOnDVD.com. 2007-05-25. Archived from the original on 2013-11-09. Retrieved 2013-08-01.